A concerned Colorado citizen called the police after becoming concerned that a Tesla owner was putting children in the boot of their car – without realising that the model in question comes with rear-facing children's seats. Captured on CCTV footage, the video shows police officers parked outside a residence, waiting for a car to approach. 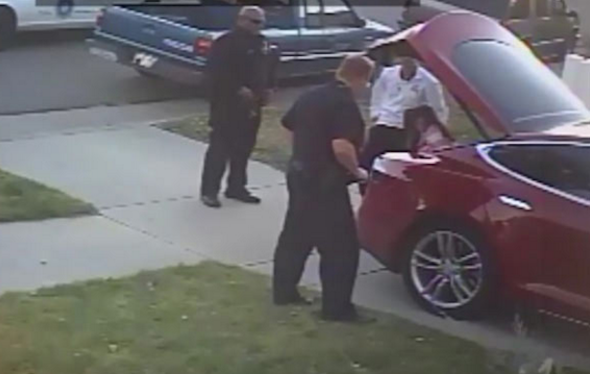 The video skips ahead to the point where the Tesla has arrived on the drive, with officers approaching the car. Explaining the situation, the officer asks to inspect the boot of the car, telling the driver of the nature of the call that they had received. After opening the boot, the officer is surprised to see children sat inside – in two factory-fitted seats. The video captures the officer's response to the finding, exclaiming to the driver: "So there's seats in there? Nice." After checking the driver's identification, the officer makes a note and allows the family to carry on. While many Tesla Model S' do not feature two rear-facing seats in the boot, this particular model does. The seats increase the Model S' passenger capacity from five to seven. The rear-facing seats are ideal for children, but are too small for adults to use. The Tesla Model S is one of the most popular electric cars made to date, offering up to 330 miles of range from a single charge. However, it also offers class-leading acceleration, with the highest-power Model S able to reach 60mph in just 2.8seconds, faster than some supercars.